The boys (mostly Grey) have recently started to notice people (especially women) around them who have different colored skin. When we saw two women who looked Indian (or Middle Eastern perhaps?) Grey pointed them out and said, "Mom! Look! They look like they're from China, like Mulan!" Since there aren't a lot of people in Salt Lake that aren't white, it's a big deal every time they see someone. I felt embarrassed when we were at Costco and a woman with very dark skin passed us, "Mom! Look at her!" Grey yelled and pointed at her. I smiled at her and said, "She's wearing scrubs, I bet she's a doctor or nurse." Grey nodded and whispered, "She's so beautiful. She's so, so beautiful." "You should tell her!" I said, feeling relieved that he had pointed at her because she was so beautiful and not because she was so black. "I don't want to," he said, very embarrassed. Then later at Ikea with Travis, Grey again pointed out some women (this time Hispanic). "Look how beautiful they are!" he said. "People like when you say kind things to them," Travis said. "If you have something unkind to say, you should keep it to yourself, but if you have something nice to say you should share it." Again, Grey was too bashful. "I'll tell them!" Micah offered, and raced over to the women. "HI!" he said excitedly. Then after a few long moments he said, "So. I spilled my milk. Haha! My dad cleaned it up. Okay, bye!" And raced back to Travis, where he proudly announced that he had done it. Any suggestions on how to talk to kids about race? Or is it even really necessary unless theres a problem? I don't want them to think being a different race is a thing or a big deal, though we do talk about different cultures a lot. Especially when Travis takes a long trip to Africa. I assume it's normal for kids to notice race and wonder about it, and I'm glad that when the boys do mention it, it's almost always just to say that other people are so beautiful. Anyway, I'd love any thoughts from you mamas out there, especially any of you who are a minority or have members of your family of different or mixed races. And now? On to other quotes! Grey: Mom! Micah bit my foot! Me: Why? What did you do? Grey: I kicked him in the mouth. Me: So what you're saying is, when your foot went into his mouth- it touched Micah's teeth. Me: That seems like it's your fault and Micah is the one who can complain. Grey: No. I'm going to complain. Grey: I can't wait! Can you can't wait too? Me: Me too! She's so brave and strong and smart. Grey: Hmm, I just love her because she's beautiful. Don't you think she's beautiful? Grey: I am so thirsty! Micah: I am sixty thirsty! Grey: I am as thirsty as a giant height! Micah: I am thirsty to outer space! Grey: I am thirsty out of this world! Me: You need to eat the dinner I gave you. Grey: I don't like it! I like pasta and 'zanya (lasagna), and I like Zanya (Sonja) Hazel's mom, not the food. And I like sandwiches but not worms. Grey: Is air made of atoms? Me: Yes, but the atoms are spaced so far apart, that's why we can move through them. Grey: The air I'm walking through is warm. Micah: The air I'm walking through is four years old. Grey: Sometimes, when I need to think, I close my eyes tight and press my hands over my eyes like this. Then it's all black and I start to see lots of beautiful shapes and stars. Ooooowee, it's all so beautiful. Wow! Look at the shapes in my eyes! Micah: I like you to tell me when I have owies or bruises on my body that I can't see. Me: Do you think there are places where you're hurt and don't know it? Micah: Yes. Maybe my chin. I can't see that. Grey: I have an owie on my eye, and I cannot see it. But I can feel it. Micah: I can see it. Grey: Is everything made up of tiny little blocks (atoms)? Grey: Is my arm made of tiny little blocks I can't see? Grey: But I can see my arm. Hmm. Is our car made of tiny little blocks we can't see? Micah: Can I drink August's water? Grey: NO! Do you want to taste like babies smell? Grey: I can't do it! I think this sign says "Only Dads can do this, not kids." Micah: Yeah, and people with magic. Grey: But we have a little magic! So why can't I do this? Micah: I had a dream and I was nine years old and had a pet snake. The snake did everything I did, and people were scared, but I said "Don't be scared- this is a good snake." Grandma Polly said, "Ah! A snake!" And I said, "This is my snake, you can pet him and he will not bite you." and the snake loved me and I took very good care of him. Me: I will give you a bowl of cereal, but only if you will lie down on the couch for some quiet time as soon as you're done. Grey: I give you my word! Me: Do you know what that means? Me: It means that you're making a promise and you have to follow through, even if you don't want to. Grey: Okay, yes. I did know that, then. Micah: Mom, I feel so sick today. I think I ate too much gluten! Red and yellow, black and white, they are precious in his sight, Jesus loves the little children of the world! The third chapter of the book NurtureShock by Po Bronson has great information about talking to children about race (the rest of the book is pretty fascinating too). Our children have also enjoyed "The Colors of Us" and "Can You Say Peace?" by Karen Katz, which are both books about race and culture. We never had to have a discussion about race in our house. We did have the conversation about people with physical disabilities. We explained it that we are all made different and like Aurora needed glasses to see some people need wheelchairs because they can't walk. We are all different and that is what makes us special. 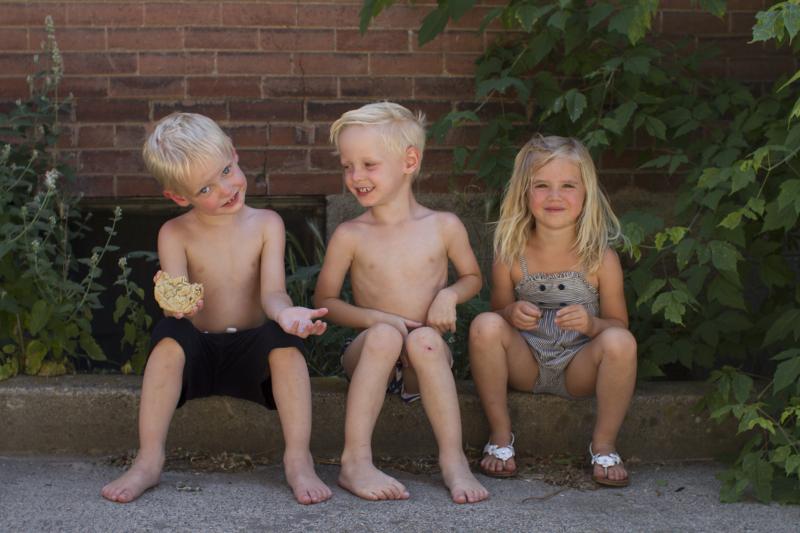 Little children speaking about gluten is pretty cute. Gabriel could read the word gluten before he could read anything else. Is that cookie gluten free? If so text me how you made it and if it was any good. I'm glad I occasionally end up in their funny quotes. I love that picture. So cute.